The life of an interstellar journalist is not as glamorous as you might think. Take Lex Falk - an award-winning media veteran, he’s at the top of the heap and still being sent to tedious new colony worlds like Eighty-Six to cover minor brush wars. However, despite being carpet-bombed by corporate PR upon arrival, Lex is a good enough journalist to spot that something is amiss on Eighty-Six. Having exhausted all conventional channels, Lex turns to some one-time colleagues to discover what is making Eighty-Six’s corporate investors so nervous. What can possibly be threatening the rate of return on such a dull but predictably blue-chip world? And, worse still, can it really be true that the secret is dangerous enough to attract Bloc agents and turn the galactic Cold War hot? Embedded really surprised me. 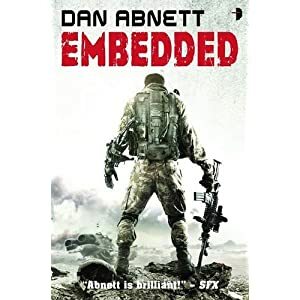 I’d never heard the name Dan Abnett before, and had been disappointed by a number of not-dissimilar sounding mil-sf novels by unfamiliar authors recently. So my expectations were fairly low. Fortunately it turns out that Abnett can write – really write. His prose is tight, fast-moving and evocative. My first thought was what a pleasure it was to read someone so obviously familiar with the craft of writing. Hard on the heels of that was the realization that Abnett can world-build pretty well, too. With just a few choice phrases, throwaway brand names and observations I was not only seeing this universe but I believed in it too. Understanding the politics driving events on Eighty-Six and the game of playing join-the-dots with our present-day world, it all felt grounded in a cynical, messy – but not too dystopian – milieu. Later combat scenes continue to dazzle, bringing comparisons with Richard Morgan in their logic and the unravelling chaos they unleash. There is very little glory in Abnett’s combat zones, only terrified human beings working at the limits of their training and capacities, living on adrenalin and borrowed time. If Abnett has never been in a warzone himself then he must surely have spoken to some who have - that’s how real Embedded’s combat scenes feel. Things do falter at the end. The story concludes both suddenly and rather inconclusively, with no obvious sign that Embedded is the first part of a series (which I hope it is). Ending aside, however, this is a simultaneously thoughtful and hardboiled read. The smart backstory teases a real world out of very little actual detail whilst the combat sections had me trembling with tension. Achieving such an effect using only printed words on a page marks Abnett out as an author to watch. To use a couple of his own repurposed adjectives: the man is wealthy; he’s golden!